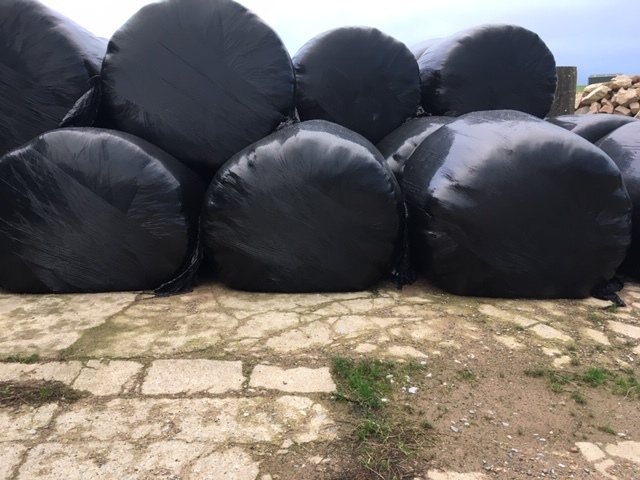 It does not matter if a bale of silage is at the bottom of the pile with lots of bales on top of it or if it is resting all by itself. The meeting of the bale with the hard ground always pushes the bottom of the bale flat. What is inside the plastic wrapping is rotting down. Without the plastic keeping it in its bale shape, it would just be a puddle of mush. No, that is not right. Without the plastic wrapping it would not be closed in and rotting. It would not be silage. It would be a bale of something but it would not be silage. It would just be a bale of straw. Or a bale of hay. I have laid poison in both barns. I do not like to kill mice but I do not like living with mice either. In the house, I set traps. I can never decide if it is worse to find a poisoned mouse staggering about in agony and in death throes after being poisoned or to find a small body squished in a trap mixed up with the peanut butter that lured her there. This morning the lower barn smells like a dead mouse but I cannot locate the corpse. The upper barn does not smell of death but there are several large fat flies flying around lethargically. The weather is unseasonably mild so there are more insects than usual for the time of year. These obese flies are probably blue-bottles. They are usually a sign that there is a dead something nearby. Walking with a dog who turns his head and looks back to make sure that you are turning the corner when he thinks you should be turning the corner or just checking that you are not lagging too far behind is good. It means you are not walking alone. Oscar has been leading me out on every walk he can. He continues to wheeze like an old tractor but he is willing and eager to rush along ahead of me. He hops off the ground with all four feet when we meet. As we dropped down and out of the field to meet the road today, I saw two small flashing blue lights in a place where I have never seen blue lights. It was a place where I have never seen any lights. Daylight was dropping fast. It was dusk or it was almost dusk. Oscar and I ran over to the flashing blue lights. They were two small strips laying on the road edge calling attention to a sign with an arrow. 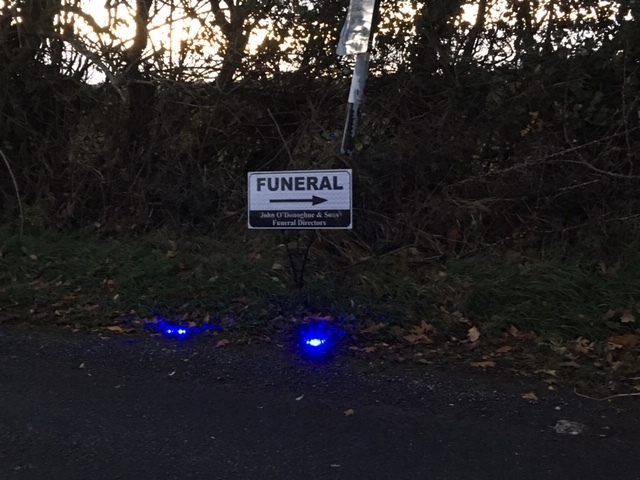 The sign said FUNERAL. There is no church nearby. I had not heard of any one dying in the area. Either the signs were directing people to a wake at a house or there had been a burial up in the old graveyard at Tullaghmelan. A burial up there is a rare event. The only people who get buried up in that graveyard are very old. I think they have to have a family plot already set aside. The road is too narrow to allow two-way traffic especially for people who are not in the habit of such roads. Especially in the dark. Breda told me that the Guards had directed the traffic to go away from Grange Cross but still we had no idea who had died. I found the blue lights exotic. Oscar did not care. He waited down the track for me to catch up with him. No one knew where they went. It was a matter of huge discussion for weeks. One after another the geese in Ardfinnan went missing. One goose at a time. There have always been geese on the green and in the river. The playing field gets slippery with goose droppings but no one ever objects because there have always been geese on the green in Ardfinnan. It is as if the geese have the right of way. Ten or twelve geese disappeared over a two week period. There were no feathers and no signs of struggle. They did not fly away. They could not fly away. Their wings had been clipped. Everyone believed that a Two-Legged Someone took the geese. In the butcher shop, they said no one could eat the geese because they would be much too tough. One goose was left behind. It mourned and became very sad. Another goose was brought in from somewhere to keep the single goose company. Today there is great excitement in Ardfinnan. Someone, it might have been Tommie Myles the butcher, drove all the way to Galway and came back with eleven geese. A small crowd gathered to see them unloaded. Since then everyone has been down to the river to look at them. Now there are thirteen geese on the green in Ardfinnan. The village feels complete again. There is the small worry that these geese might disappear too. For the moment everyone is delighted. TOO RAUCOUS FOR A CHORUS is the title. I am thrilled with my new book. I cannot stop looking at it. As usual, I have been moving it around the house to surprise myself with its presence. The blue cover glows from across the room. I have one copy here and Laurie has one copy in Scotland. We are waiting for Stuart to finish binding some more. All we can do is to wait. We can hardly be impatient now. I think it took us ten years to make this book. 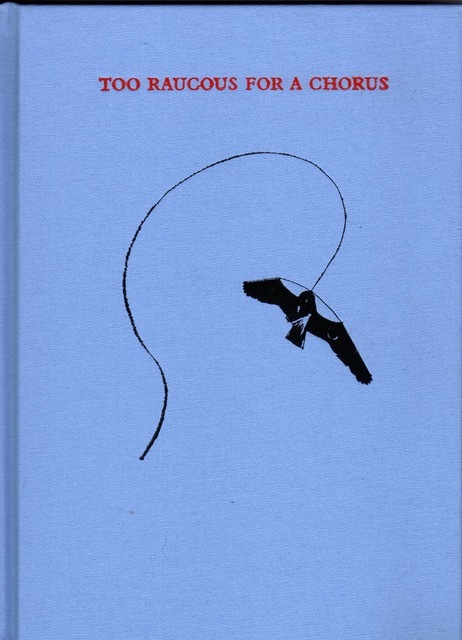 We always wanted to make a book about birds together but neither of us never knew what the book might be. My knowledge of birds is so paltry. 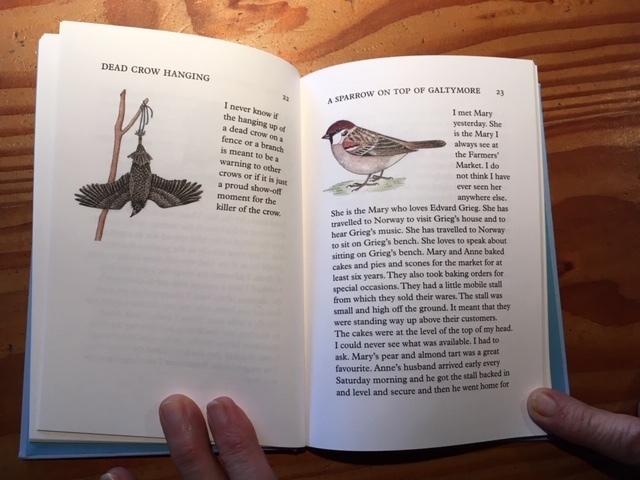 Finally these texts came together celebrating bird life, marking both small observations and small disasters. Laurie’s drawings could not be more perfect. We were surprised that the bus from Dublin airport was such an old bus. It was a town bus. It was a double-decker and not the usual type to drive distances. The X8 buses are normally high and modern and they have large automatic doors on the side to slide luggage into. This bus was so low to the ground that we each had to take our bags into the bus and try to find a place for them in between seats. The driver told us not to go upstairs. He said that we could go up there if we wanted but he recommended that we not go upstairs. He said it was roasting hot up there. He said he had No Knowledge of how to turn off the heat. This was not his usual bus. This was not his usual route. He said there was No Luck in this bus. He did not know what he had done to be given this bus for the day. He told an Indian lad who got on that he might enjoy the heat upstairs but he said no one else will like it. He told the lad that no matter where he sat he himself would wake him up in Cork. He said it will be at least four hours until we get there but No Worries, he said, I will wake you up. The bus was old and wobbly and as soon as we started off the rain began. The downstairs of the bus was freezing cold. The bus was not made for motorway speed. We did not go as fast as the bus was schedualed to go. We just puttered along. The windscreen wipers were squeaky and loud. It was dark. There was nothing to be seen outside the bus. There were no lights anywhere. Cashel was the first stop out of Dublin. That took us more than three hours. By the time we got there, we were well late. A young woman told the driver she was desperate for the loo. Our bus was too old to have a toilet on board. The driver told her to run across the road to Feehan’s Bar. She left her belongings on the bus. He promised that we would wait for her. The driver sang us a song while we waited. He had a fine voice. It was not a song that I recognised. He sang it with a strong Cork accent. We all applauded when he finished. He did not sing a second song. Water was running down the aisle. The man behind me was going through his bag of groceries trying to find what was leaking. He announced each item as he pulled it out of the bag. He decided it must be a bottle of water at the bottom of the bag. He said he usually packs carefully so that nothing leaks. When the woman finally returned from the loo, she looked dreadful. She went upstairs. We set off again. The Indian lad was sitting beside the man with the leaking bag. He announced that he needed to get off in Fermoy not in Cork. The man with the leaking bag explained that after Cahir and after Mitchelstown, the very next stop would be Fermoy. The woman across the aisle said that she herself was getting off at Fermoy so she said she would alert the man from India when to get off. The driver heard all this and he shouted down the aisle that he would be calling out Good and Noisy-Like when the bus reaches Fermoy. We got off in Cahir. With so much help I have no doubt the Indian lad got off in Fermoy okay. Everyone was eager to make him feel welcome because he was so far from his home. Train. Plane. Bus. A lift from Breda and home. London to Ballybeg was a ten and a half hour journey.